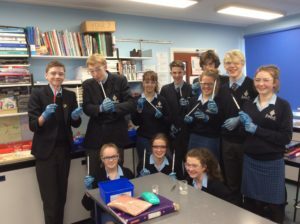 The Year 11 Single Award Chemistry class had a great practical lesson making nylon this week. This is part of the organic chemistry section of the syllabus with nylon being formed from 1,6 diaminohexane in water and sebacoyl chloride in cyclohexane as part of a condensation polymerisation reaction. It is a really tricky practical and the nylon needs ‘teasing out’ of the layers between the two chemicals to form long strands of nylon which can be collected on a glass rod. Some food colouring was added to give the red polymer.’ Great work Year 11.